Many on the left believe the Internet can fill the gaps left by the disintegration of modern political organisations, but online discussion forums and the like simply do not work in the same way. This is not to say that new forms of medium cannot assist political resistance, especially in communicating very quickly repressive political practices that appear to demand an immediate response, but it is hard to imagine how they might compensate for the immediate social engagement that accompanied, for example, the establishment of labour unions and workers’ associations. Internet forums cannot reach out to the disinterested or the antagonistic and, over a prolonged period of time, seek to educate, persuade and establish trust and a shared vision. They cannot encourage the disengaged to become attuned to the attractions of progressive politics by interacting daily in bodily proximity with others keen to connect their shared situation to forces beyond their immediate comprehension. In the absence of everyday mass encounters in exploitative work situations, the task of building the kinds of organisation that might politicise the depoliticised is huge. Across the last few decades the logic of activism, and of digital activism in particular, have changed dramatically. We have experienced what could be regarded as three waves of protests from the early 1990s to the present. Each of these waves is connected both by the transformations in global capitalism and the rise of the digital age, while still displaying differences or rather developments in movement-based organizing. Together however, we can conceive these three waves as part of one broader epoch of contention. Those particular waves of contention are: Global Social Justice, Occupy/Arab Spring, Syriza/Podemos. In this special issue, we propose to look at the logics of these waves of protest (or generations of digital activism) in order to explore their similarities and differences. The goal of the special issue is to mine history assuming a diachronic perspective, but more concretely to understand the strengths and weaknesses of this epoch of contention as we watch the current wave of struggle unfold. – How have capitalist transformations informed the emergence of the current epoch of contention and how has the activists’ relation to communication technologies evolved and shaped the logics of protests and mobilizations? – Can we conceive of underlying meta-logics of movement politics informing the three waves of protests, and how are they best conceptualized, similar as well as differently enacted? 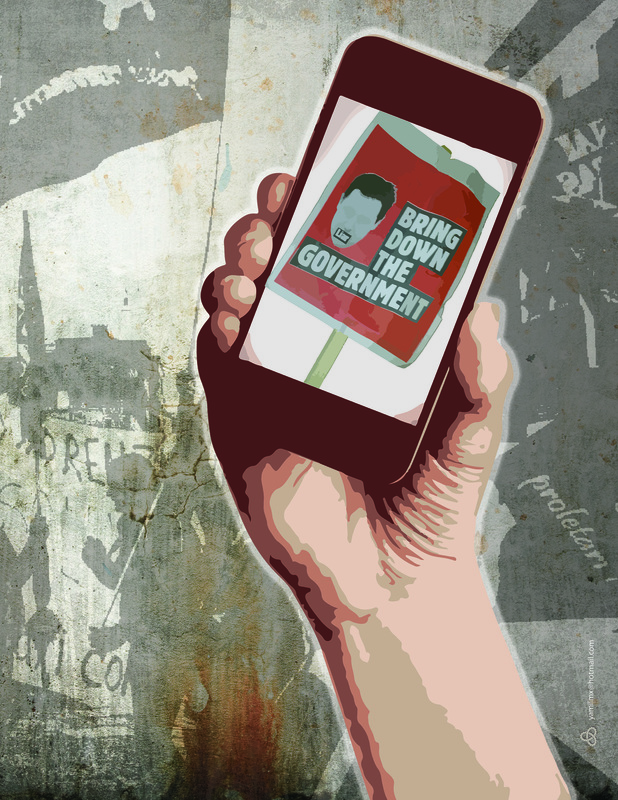 – How have the communication repertoires of social movements evolved, and how have the role of alternative media and activists’ media practices changed in an oversaturated media environment, where the influence of digital capitalism has grown and corporate media are increasingly dominating the digital activism scenario? – What are the main challenges and the tensions that social movements and their communication face when they crystallize into political parties? – What lessons have we learned from the analysis of this epoch of contention and what are the future horizons of digital activism and protest? Please send 300 words abstracts-proposals by 20 December 2015 to both the following email addresses: wolfsont@gmail.com AND pnfunke@gmail.com – with “Two generations special issue” as an object, indicating: tentative title, full name, affiliation and email. The abstract will have to include the methods deployed and the principal findings or, in case of more theoretical contributions, the main authors and theories used. We particularly welcome original contributions that defy traditional understandings of social movements, digital activism, and digital politics, and critically reflect on their evolution in a diachronic and comparative perspective. Case studies and experiences from non-Western countries and contexts are also especially welcomed. tripleC is a journal for the critical study of communication in capitalism, using approaches such as critical theories, Marxist theory, political economy of communication, etc. It has a special interest in disseminating articles that focus on the role of information in contemporary capitalist societies. For this task, articles should employ critical theories and/or empirical research inspired by critical theories and/or philosophy and ethics guided by critical thinking as well as relate the analysis to power structures and inequalities of capitalism, especially forms of stratification such as class, racist and other ideologies and capitalist patriarchy. All articles in tripleC connect a specific studied phenomenon to the broader societal context, especially capitalism as economic formation and a form of the organisation of society. Papers should reflect on how the presented findings contribute to the illumination of conditions that foster or hinder the advancement of a global sustainable and participatory information society. tripleC is edited by Christian Fuchs (University of Westminster) and Marisol Sandoval (City University London). From 1995 to 2015, Manchester Metropolitan University hosted a series of very successful annual international conferences on ‘ALTERNATIVE FUTURES and POPULAR PROTEST’. We’re very happy to announce that the Twenty First AF&PP Conference will be held between Monday 21st and Wednesday 23rd March 2016. To register, please go to https://www.kxregistration.mmu.ac.uk/AlternativeFutures2016 and complete and send the form. (If you have problems ‘clicking’ on this URL, cut and paste this address directly into your browser. Please contact Mike Tyldesley if you encounter any difficulties.) You will be given two options; “pay by Credit/Debit Card” or “Pay by Invoice”. If you use the “Pay by Invoice” option, please contact Mike Tyldesley (m.tyldesley@mmu.ac.uk ) immediately after you complete the form to let him know that you have done so and discuss your payment method with him. parts of the world have seen major forms of popular contestation. of contemporary forms of popular contestation. mobility is implied in the global spread of these protests? challenge and/or reproduce dominant cultural regimes. rms not only enable contestation, but also shape its focus and dynamics? aesthetics or connectivity – you would like to be considered. Notice of acceptance will be given by 1 July 2015. For any inquiries, please contact Amani Maihoub (E: a.maihoub@uva.nl). These are some notes I’ll be adding to as the project on social movements I’m working on with Tom Brock develops. Initially they’re aiming towards the revision of a paper and chapter we’ve written (as well as the conference paper we’re giving in a few days time) but we also have a much bigger project in mind, albeit one that will require an intimidating amount of reading before it can ever see the light of day. Given my growing inability to work out what I think about something I’ve read without blogging about it, I thought that some online notes would be a pretty helpful way of getting started. These notes will be my attempt to build upon the conversations Tom and I are having in order to elaborate upon our project and clarify what I think about the social movements studies literature I’m beginning to work my way through. One key aspect of what we’re trying to do concerns the reoccurring conceptual dichotomies of individuals and groups. We want to overcome this dichotomy but do so on in a way that resists the temptation to subsume these categorical distinctions into the study of networks. It doesn’t follow from the demonstrably fuzzy character of the boundaries of social movements that they have no status beyond being a construct of the analyst or a collective identity shared by diffuse networks which have undergone a process of mobilisation. We propose to start at the level of social ontology because we think that these underlying ontological questions inevitably inform the methodological ones which guide empirical analysis. While we agree that, as Gemma Edwards (2014: 142) puts it in her discussion of Melucci’s work, “Constructing a sense of ‘we’ who are against ‘them’ in a conflict over ‘this’, is what social movements have to do in order to be effective at mobilization” (Edwards 2014: 142) we disagree about the understanding of collective identity invoked here. 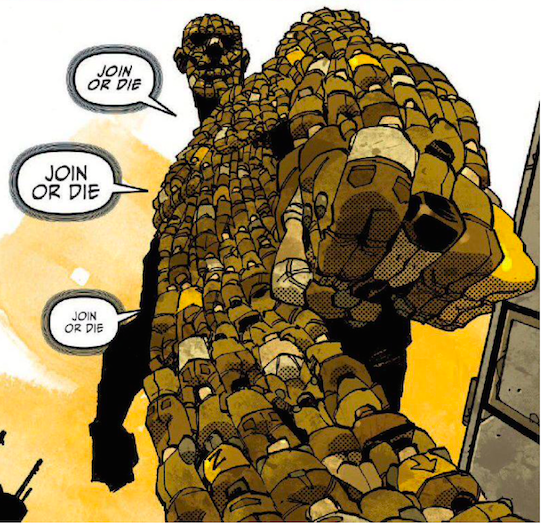 In fact the notion of ‘collective identity’ seems problematic in itself when it is invoked to explain how individuals coalesce into a wider movement. In this sense engaging with Melucci’s work will be crucial to developing our argument. But we think that what seems to be, in work influenced by Melucci and beyond it, a tendency to invoke collective identity can better be explained in terms of a converging evaluative orientation towards relational goods which emerge through situated interaction. As well as Melucci, it will also be important for us to engage with Blumer because, in spite of the problems with collective behaviour theory, we want to argue that events are crucial sites through which social movements are (re)constituted – this may be reproductive (mundane meetings, social events, shared logistical work) and it may be transformative (demonstrations, occupations, encampments). What our approach is orientated towards is registering three distinct dimensions of change (biographies, networks and movements) as well as the role they play in reproducing or changing the internal structure of the social movement. In doing so, we recognise the way in which other social agents can influence the composition of the movement through their effects on individuals, networks or the movement as a whole. 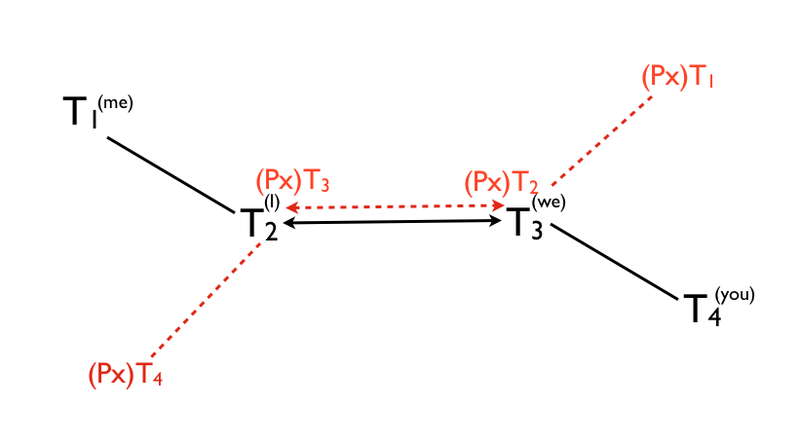 The basis of our approach is to look to processes pertaining to networks and individuals, understanding the former to be constituted through the interactions of the latter within a situated milieu (t2-t3), with emergent consequences for individuals and the network of relations obtaining between them (t4). In using this morphogenetic approach, in which the t4 of one cycle is understood to constitute the t1 of another cycle, we attempt to disengage the different features of dynamic processes in a way that respects their dynamism. The exercise is not intended to offer a total theory of a social movement but rather constitute a methodology for the analysis of qualitative data which can help us understand the changes undergone by the informal networks (and the related individuals out of which they are composed) in a way that can be incorporated productively into realist sociology. We’re trying to retrieve the ‘on the ground’ situation, not as an ethnographic addendum, but rather because we think that the ‘grouping and regrouping’ of agency which defines what Archer calls the double morphogenesis needs to be understood in terms of processes arising from its internal constitution as well as those processes arising from the action of the social agent as a collective acting in relation to other collectives and subject to the consequences of those actions as well as the unintended consequences of the broader struggle. However unless there’s a practical pay off to this abstraction then it’s of questionable value. That’s why the third aspect of our project is likely to be the most time consuming. We want to engage in a series of case studies, likely to be dependent on secondary data unless we can get funding – though we engaged in a digital ethnography (albeit of a rather informal and truncated sort) for our student movements paper – in which we analyse contemporary social movements and make a case for the explanatory gain that ensues from applying this realist theory of social movements. Critical engagement with existing traditions within social movement theory relating to individuals, networks and collective agents. Developing an account of the morphogenesis of social movements which builds on Archer’s morphogenetic approach, Archer and Donati’s relational realism and my PhD work on personal morphogenesis. Elaborating upon the approach through a series of detailed case studies of contemporary social movements. These notes will likely only extend to the first part of the project. However I’m hoping they’ll be a useful resource for me to consult in later stages of the project, as well as an opportunity for anyone interested in social movement theory to argue with me about my interpretation of the author’s I’m engaging with. In a way social movements are what I always wanted to study most, though didn’t for rather convoluted reasons, so it’s exciting to get started. Much of my interest stems from the way I realise that I’ve been changed by my participation in social movements (particularly the anti-war movement in my late teens and my two stints in anarchist organisations of very different sorts) and it’s this aspect of social movements that I hope we can incorporate into this developing theoretical approach. I think this is an important aspect to the culture of social movements. I’m not sure how effectively the concept of performativity can capture this. I accept the importance of “small-scale participants’ performances that occur in networked relations” such as “encounters at meetings, planning sessions, recruitment forays, and socializing” as sites “where movement ideas are discussed, elaborated, and ‘performed'” in a way that ‘grounds’ “rationales and motivations for action” (Johnston 2014: 22-23). But what concerns me about this is the exhaustive focus upon interaction. In my PhD I’ve developed a critique of symbolic interactionism, accepting the importance of interaction for the constitution of relationships and persons but arguing that we need to look at what goes ‘into’ and ‘out’ of social situations. If we only focus on the situated interactions and performances (T2-T3) we obscure the important questions of how persons have been shaped by past interactions (T1) (conditioning what they bring to the present interaction) and how this will shape how they approach future interactions (T4). Obviously sophisticated symbolic interactionists will recognise this but the conceptual repertoire they’re using will inevitably tend towards compression, shutting down the questions of temporal extension through a presentist vocabulary which struggles to support temporal distinctions. This isn’t a repudiation of symbolic interactionism but is rather an attempt to engage constructively with it. I think the relational realism of Margaret Archer and Pierpaolo Donati tends, for a variety of reasons, to underplay interaction. Realists can learn about how to better address the T2-T3 from symbolic interactionists. But in doing so, they bring their insights about the T1 and T4 in a way which fleshes out the sociology of the situation. So when Johnston (2014: 23) talks about the “dense network of performances, macro and micro, through which both the structural sphere and the ideational-interpretative sphere are acted out in real time” I couldn’t be more in agreement about the general direction of thought. I think the micro-social dimensions to social movements do constitute, as he puts it, “the multitudinous building blocks of a movement’s structure and its ideations”. But I want to bring the person more fully into this picture, understanding their trajectories through social movement participation rather than simply focusing on performances. Social movements are made of people, both aggregatively and emergently, in a way which renders individual biography an important unit of analysis. Performances are an important part of what people do and it’s a crucial concept for understanding the unfolding relationships between them within situated contexts. But it is the people who are primary rather than the performances. Please find below the call for papers for the panel “Social Movements and Memories”, proposed to the ECPR general conference 2014. Please feel free to distribute this call to interested colleagues. Though large protests often surprise observers, they hardly start from scratch. Mostly, they are rooted in previous mobilisations with respect to their diagnostic framing, forms of organisation, and repertoires. Memories of previous mobilisations crucially influence which activities are considered helpful or successful and which are not. Hence, analysing memories allows crucial insights into social movement dynamics and continuity. Memories are, at the same time, outcomes of mobilisation and significant factors in shaping further mobilisation. In the last few years, the interest in collective memory has been constantly growing among scholars of contentious politics. In this context, memory studies and in particular the sociology of memory based on the seminal work of Maurice Halbwachs, have become fundamental tools in advancing our understanding of social movements. These approaches provide useful insights into the symbolic construction of the reality in which collective action takes place. On the other hand, contentious politics approaches inform the growing number of studies on the conflictual dynamics of memory. This panel aims to discuss the role of memories in social movements. How does the past and its public representation influence mobilisation? How do social movements participate in the construction of public memory? How and why do some specific events from the past become fundamental symbols for social and political contention, while others do not? How does diffusion of practices, symbols, and repertoires of mobilisation work over time? We welcome submissions coming from different disciplinary fields, in the attempt to bring together the scholarships on social movements and memory studies. Each abstract will be evaluated for: quality and clarity of the research question; methodological precision of the comparative approach; theoretical originality of the contribution and discussion of available knowledge; relevance and pertinence to the panel’s theme. We would all agree that social movements are ‘collective’ ventures, for example, but what makes a venture count as collective? Is it a matter of numbers? If so, how many? Is it a matter of a type of interconnection between people, an organization or network? If so, how is that interconnection itself deﬁned? Does ‘wearing the badge’ and ‘buying the T-shirt’ make one part of a movement or must one attend monthly meetings and engage in protest? And if the latter, what counts as protest? Would wearing the aforementioned badge count as a protest or must one stand in a group of three or more people waving a placard? There can be no decisive answers to these questions. While Crossley is undoubtedly correct about there being ‘no decisive answers’ to these questions, I like this quote because it delineates the contours of the issue: the social movement (macro), the interconnected networks within it (meso) and the varying forms of individual participation (micro) without which there would be no ‘social movement’ but to which the emergent agent cannot be adequately reduced. This is because the activity dependence of the social movement can best be understood in the past tense i.e. the present characteristics of the social movement are emergent from the past (inter)actions of those participating in it. It’s this introduction of temporality, as well as seeing collective agents as ontologically stratified, which precludes the collapse into a structurationist affirmation of social movements being constituted and reconstituted through the activity of the individuals within it. What really interests me is the possibility of understanding social movements in a way which can incorporate the macro, meso and micro within the same frame of reference: so its nature as a ‘collective venture’ is explained in terms of the ‘interconnections between people’ and the activities which the people so interconnected engage in over time and the variable meanings they attach to this activity. So I guess my broader point is to try and advocate an approach to the ontology of collectives which builds from the ‘bottom up’, understanding the biographical patterns which lead people into patterned interaction towards shared ends but also how past cycles of such interaction led to the emergence of constraints and enablements on the present interaction of participating individuals. • lumps social movements together with other assorted forms of ‘collective behaviour’, such as fashions, crazes and panics, without any due consideration for their distinctness and properly ‘political’ nature. The emergence of the new replacement paradigm has come in a number of stages. Early developments tended to centre upon two key elements. First, a rational actor model of the social agent was appropriated, along with an economistic focus upon exchange relations in social life and the effects of the movement of resources between agents. Second, a structural ‘network’ model of social relations and social life was adopted. With these elements movement theorists from within the ‘resource mobilization’ approach were able to examine the balance of costs, rewards and incentives that provided agents with the motivation to become involved in struggle, and they were able to focus upon the block mobilization of whole communities. Many features of this resource mobilization approach have persisted in American movement analysis but by the 1980s they had been added to by a consideration of the ways in which political systems and processes variously open up and close down opportunities for protest, thereby affecting the ﬂow of activism itself. Rational actors, it was argued, will tend to act when the opportunities for doing so effectively are greatest. Each seems to be a prime example of what Margaret Archer (2007) calls the ‘two-stage model’ where subjective properties are imputed to agents as a ‘dummy for real and efficacious human subjectivity’. I’m reading Castells at the moment and his recent work could be construed as a much sophisticated instance of the same generic mistake: bringing subjective concerns (‘outrage’ and ‘hope’) into the account but doing so in an excessively psychologistic fashion. Subjects’ own constellations of concerns, as subjectively defined in relation to the three orders of natural reality: nature, practice and the social. Courses of action are produced through the reflexive deliberations of subjects who subjectively determine their practical projects in relation to their objective circumstances.